I was sitting in my lounge, a book in my hand, reading in the yellow glow of the standard lamp. 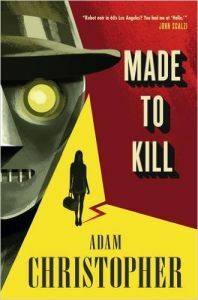 The book was a hard back, all yellow and red with the face of a steely private eye staring at me from the cover beside the silhouette of a dame with a duffel bag. By now, I knew what was in that bag, having read the first couple of chapters.